Men who live their lives on the level of naturalism are tied down at all times to earthly concerns, chief of which is the measure of their "success" in the eyes of others. There are various types of "success," of course. Naturalists in the private sector of commerce are concerned about the levels of their income. Naturalists in the fields of "entertainment" and sports quest after high levels of income and massive amounts of publicity. Naturalists in the realm of politics and governance care mostly about the acquisition and retention of political power, replete with all of the perquisites from accrue from such power, as an ultimate end in and of itself. True to the man whose "philosophy" served as a "bridge" between Christendom and Modernity, Niccolo Machiavelli, the modernists who populate both major organized crime families in the United States of America, the Democrat Party and the Republican Party, want to "win" for the sake of winning. All manner of sophisticated means of achieving electoral "success" have been devised and refined in past thirty-five years or so since the development of methods of computer modeling and statistical abstraction, which makes it possible for random samples of whatever particular "universe" being polled to be composed of fewer and fewer people. (A "universe" is that part of a demographic segment of people that a pollster desires to question. A "universe" might consist of a small segment of the population, or it might consist of the entirety of citizens of voting age, or it might consist only those who classify themselves as "likely" voters who are registered to vote.) Polls, which used to take several weeks to produce because of the large number of people included in samples and the long time that it took to abstract the statistical information derived in the polling process, can be produced now on a nightly basis. And although even some of the best pollsters and their organizations can make monumental errors now and again, polling is a reasonably good "snapshot" of "public opinion." Polls are used by political consultants to advise political parties and their candidates what sorts of "messages" will "play" with the particular universe (or universes) that they desire to target in a primary or a general election. Tactics are then devised to "penetrate" polling trends by means of negative advertising, which negative advertising is usually, although not always, "text marketed" before it is played in some forum of the mass media. The goal of all of this is to "win." Only a handful of career politicians refrain from the use of pollsters. This is not make the ideas of those who refrain polling any better than those to do use it if said ideas are opposed to the binding precepts of the Divine Positive Law and the Natural Law. It is, however, a rarity, to find any career politician from the false opposites of the naturalist "right" and the naturalist "left"who eschews polling in the advancement of his career. Alexis de Tocqueville did not realize that the American republic was founded on false, naturalistic principles, that it was bound to degenerate over the course of time into the opportunistic and materialistic free-for-all that has produced coarseness in the popular culture, mendacity in commerce and positivism in its politics and governance. The emergence of a caste of career politicians intent on securing and retaining as much power and privilege as possible was but a logical result of a constitutional regime that made no room for the Most Holy Trinity and was based upon man's ability to pursue "civic virtue" without a due submission to the Deposit of Faith that the Second Person of the Blessed Trinity made Man in Our Lady's Virginal and Immaculate Womb, Our Blessed Lord and Saviour Jesus Christ, and without belief in, access to and cooperation with the graces won for us by that same Word made Flesh on the wood of the Holy Cross by the shedding of His Most Precious Blood and that are made present in the world by the working of the Third Person of the Blessed Trinity, God the Holy Ghost, ad that flow into our hearts and souls through the loving hands of Our Lady, the Mediatrix of All Graces. Those who do not live and work at all times and in all of the circumstances of their lives for the honor and glory of the God--Father, Son and Holy Ghost--through the Sorrowful and Immaculate Heart of His Most Blessed Mother contribute to the tearing down of order in the world. Thus it is that the naturalistic world of career politicians is an illusion created by men who do not think of First and Last Things, men who consider themselves "gods," at least after a fashion, men who get offended at the any perceived slight, real or imagined, men think that their constituents exist to enable their own careers in power and for the enjoyment of perquisites, men who get panic-stricken when it dawns upon them that their political tricks no longer work, that other naturalists who are more clever than they are emerge to take their place as the organized gangsters du jour. This sense of panic has struck Congressional Republicans as seventy-six months of George Walker Bush's plundering the treasury of the government of the United States of America to fund an unjust and immoral war as his friends in the corporate world continue to outsource jobs overseas while raising prices at home to maximize profits so as to continue exorbitant rates of remuneration that are out of all sense of proportion and justice have brought them to the realization that their time in power has come to end. For those whose only end is power, however, panic is the only response that they can muster in the face of the loss of that for which they live and crave and have sought to hold onto so tenaciously as no thought at all has been given to the pursuit of the common temporal good in light of man's Last End. All of this proceeds in cycles as the public, consumed with its bread and circuses, tires of one set of gangsters in favor of others, content to believe that secular "salvation" comes from the election of the right sort of naturalist, who will then rob them of their own property to "solve" problems that have been created proximately by the promotion of various evils under cover of law, starting with the undermining of the family and its rights by means of divorce, contraception, abortion and the fraud that is the propaganda machine of public schooling. Only one thing is constant as civil law is further corrupted and popular culture is further coarsened: the power of the civil state grows more and more no matter who gets elected. Most citizens, arrogating unto the state complete obedience even when its ordinances are contrary to God's law and thus the good of their own souls, go "baa, baa" as to object would mean to take time away from their naturalistic, materialistic and hedonistic pursuits that define practically every single moment of their lives. Just a brief review of the political history of the United States of America will reveal only one kind of change: the increase of the power of the civil state and the corruption of law and popular culture. Federalists and Anti-Federalists did indeed have their differences at the beginning of the second form of national governance under the Constitution, which succeeded the Articles of Confederation in 1789 as the governing document of the Federal government. Those differences, however, gave rise to the formation of the first national political parties. It was not too long after that that principles of the competing sets of naturalists gave way to rank careerism, which was exploited by Andrew Jackson in his quest for the Presidency of the United States of America in 1824 and 1828. The Masonic Jacksonians were in favor, with a few exceptions here and there, until the War between States. The Masonic Republicans were dominant in presidential elections for all but sixteen years between 1860 and 1932. Masonic Democrats (Franklin Roosevelt and Harry Truman) and their statist confreres (John Kennedy, Lyndon Johnson) governed for twenty-eight of the succeeding thirty-six years. The naturalistic spirit of Judeo-Masonry was kept alive in the Republican administrations of Richard Nixon, Gerald R. Ford, who was a thirty-third degree Mason, Ronald Reagan and George Herbert Walker Bush between 1968 and 1992, save the four years of the reign of appeasement represented by James Earl Carter, Jr. William Jefferson Blythe Clinton and his era of brazen criminality (White House fund-raisers featuring Red Chinese arms merchants) and intimidation of Americans opposed to the taking of innocent preborn life was succeeded by George Walker Bush's seventy-six month reign of unjust warfare, curbing of legitimate personal liberties, the increased funding of "family planning" programs both domestically and internationally, and the use of torture and illegal detention to better "secure" the nation (as the nation's southern border with Mexico has served as a sieve to provide illegal, cheaply paid and poorly treated workers to be exploited by corporate America). Anyone who thinks that any of this represents "progress" is thinking naturalistically. The measure of national greatness is not wealth or international dominance or "progress" in realms of science or technology or the "upward mobility" of various demographic groups. The measure of the greatness of a nation is the measure by which its citizens seek to grow in holiness on a daily basis as members of the Catholic Church, people who strive for the happiness of Heaven in order that they might be ready to die at any moment so as to face their Particular Judgments and to receive the reward, after whatever time in Purgatory might be necessary to make satisfaction for the debt owed for their forgiven Mortal Sins and their unforgiven Venial Sins and their general attachment to their sins, of basking in the glory of the Beatific Vision of the Most Holy Trinity for all eternity. Is this the measure by which the average American citizen or his representatives at the local, state or national levels measures national greatness? Has this ever been the measure of national greatness in the United States of America? Taking the principles we have established, we can easily answer the question, whether we are or are not a great people, whether the path we are pursuing leads to true nation al greatness, or whether it leads from it. Are we as a people intent on gaining the end for which our Maker designed us? Are we remarkable for our humble observance of the precepts of the Gospel? Are we diligent to yield that obedience to which is promised eternal life? Far, very far, from it. We are a proud, loud-boasting and vain-boasting people. Our god is mammon, and our righteousness is thrift. Is it not so? To what do we point as proofs of our greatness? Is it not to our industrial achievements, our railroads, canals, steamboats, commerce, manufactures, material wealth and splendor? But where are our moral achievements, the monuments of our enlightened zeal for God, and humble devotion to his will? Religion we have in name, in form, in many forms and many strange forms; but where is the deep, all-pervading, all-active conviction that this world is not our home, that it is but an inn in which we may lodge for a night, but in which we may not, must not, dwell? Alas! the dominant passion of our country is worldly wealth and worldly distinction. We see it in the general pursuits of the people; we hear it in the almost universal tone of conversation; and we see it distinctly in the general scramble for wealth, in our demoralizing political contentions, and the all-devouring greediness for place and plunder. So, too, the liberty of thinking, and of publishing, whatsoever each one likes, without any hindrance, is not in itself an advantage over which society can wisely rejoice. On the contrary, it is the fountain-head and origin of many evils. Liberty is a power perfecting man, and hence should have truth and goodness for its object. But the character of goodness and truth cannot be changed at option. These remain ever one and the same, and are no less unchangeable than nature itself. If the mind assents to false opinions, and the will chooses and follows after what is wrong, neither can attain its native fullness, but both must fall from their native dignity into an abyss of corruption. Whatever, therefore, is opposed to virtue and truth may not rightly be brought temptingly before the eye of man, much less sanctioned by the favor and protection of the law. A well-spent life is the only passport to heaven, whither all are bound, and on this account the State is acting against the laws and dictates of nature whenever it permits the license of opinion and of action to lead minds astray from truth and souls away from the practice of virtue. To exclude the Church, founded by God Himself, from the business of life, from the making of laws, from the education of youth, from domestic society is a grave and fatal error. A State from which religion is banished can never be well regulated; and already perhaps more than is desirable is known of the nature and tendency of the so-called civil philosophy of life and morals. It is indeed a grave and fatal error to exclude the true Church from civil life, basing that civil life on the quicksand of religious indifferentism and the lie of "religious liberty," termed a heresy by Pope Pius VII in Post Tam Diuturnas, April 29, 1814. Atheism and barbarism are the only possible consequences of a governmental system founded on the false premises of religious indifferentism and religious liberty. There is no practical difference between Western naturalism and the anti-Theism of the French and Bolshevik Revolutions as each proceeds proceed from false premises. Western naturalism proceeds from an outward indifference to the true religion, although many of the American founding fathers were indeed overtly hostile to Catholicism in their "private" remarks. The French and Bolshevik revolutions proceed from a hatred of the true religion. The results, however, are the same over the course of time: the triumph of statism as the populace are reduced to but the mere creatures of the state. The doctrine of modern Communism, which is often concealed under the most seductive trappings, is in substance based on the principles of dialectical and historical materialism previously advocated by Marx, of which the theoriticians of bolshevism claim to possess the only genuine interpretation. According to this doctrine there is in the world only one reality, matter, the blind forces of which evolve into plant, animal and man. Even human society is nothing but a phenomenon and form of matter, evolving in the same way. By a law of inexorable necessity and through a perpetual conflict of forces, matter moves towards the final synthesis of a classless society. In such a doctrine, as is evident, there is no room for the idea of God; there is no difference between matter and spirit, between soul and body; there is neither survival of the soul after death nor any hope in a future life. Insisting on the dialectical aspect of their materialism, the Communists claim that the conflict which carries the world towards its final synthesis can be accelerated by man. Hence they endeavor to sharpen the antagonisms which arise between the various classes of society. Thus the class struggle with its consequent violent hate and destruction takes on the aspects of a crusade for the progress of humanity. On the other hand, all other forces whatever, as long as they resist such systematic violence, must be annihilated as hostile to the human race. What would be the condition of a human society based on such materialistic tenets? It would be a collectivity with no other hierarchy than that of the economic system. It would have only one mission: the production of material things by means of collective labor, so that the goods of this world might be enjoyed in a paradise where each would "give according to his powers" and would "receive according to his needs." Communism recognizes in the collectivity the right, or rather, unlimited discretion, to draft individuals for the labor of the collectivity with no regard for their personal welfare; so that even violence could be legitimately exercised to dragoon the recalcitrant against their wills. In the Communistic commonwealth morality and law would be nothing but a derivation of the existing economic order, purely earthly in origin and unstable in character. In a word. the Communists claim to inaugurate a new era and a new civilization which is the result of blind evolutionary forces culminating in a humanity without God. When all men have finally acquired the collectivist mentality in this Utopia of a really classless society, the political State, which is now conceived by Communists merely as the instrument by which the proletariat is oppressed by the capitalists, will have lost all reason for its existence and will "wither away." However, until that happy consummation is realized, the State and the powers of the State furnish Communism with the most efficacious and most extensive means for the achievement of its goal. Judeo-Masonry takes many forms. Both the supposedly "benign" religious indifferentism of the Protestants and Masons and Deists who founded the United States of American and the overt hostility to the true Faith exhibited by the French and Bolshevik revolutions are manifest in civil law and popular culture throughout the United States of America. Catholicism is the one and only antidote to this madness. There are no short-cuts. There exists no naturalistic, nondenominational or interdenominational way to retard the madness of Modernity, with which Modernism has made its "reconciliation." Do any of the "bush leaguers" in the organized crime families of either major political party in the United States of America understand even one word of this, no less accept it? I can't think of one who does. Let's run down the list. Congressional Republicans? No, not one. No room for Christ the King and Mary our Immaculate Queen among them. Congressional Democrats? No, not one. No room for Christ the King and Mary out Immaculate Queen among them. The pro-abort Hillary Rodham Clinton, who invented a story of coming under "sniper fire" in Bosnia in 1996 in order to burnish her "credentials" as an experienced hand at foreign policy? Ah, I don't think so. Barack Obama is very fond of telling receptive audiences the story about how in May 2007 he walked right into the automotive lion's den of Detroit and told those industrialists they were going to have to shape up, change the way they do things and start making more fuel-efficient vehicles to protect our environment. "And I have to say," Obama tells his chuckling followers, "that when I delivered that speech, the room got really quiet. Nobody clapped." Well, in honor of Obama's return campaign visit to Michigan last week, someone -- perhaps Republicans, perhaps someone closer to home politically -- assembled videotape of Obama's oft-told tale and spliced it side by side with videotape of that actual Detroit speech. The pro-abort (in just a "few" cases in surgical abortion, you understand, only a "few," right) John McCain, who like the hapless Robert Joseph Dole, Jr., before him, is devoid of even any coherently thought out ideas on the merely naturalistic level and is totally dependent upon textual aides when speaking of public policy matters lest he fall into one or another of an increasing number of gaffes? No, no room for Christ the King and Mary our Immaculate Queen here. We must pray and worth for nothing other than the restoration of the Social Reign of Christ the King and Mary our Immaculate Queen, starting in our own families by making (and then renewing) our the Enthronement of our homes to the Most Sacred Heart of Jesus and the Immaculate Heart of Mary. We must see beyond the "trees" (that is, individual issues that are but symptoms of the natural degeneration of a world that has overthrown the Social Reign of Christ the King and Mary our Immaculate Queen) of the moment and teach our children to begin each of their prayers and their daily works in the Name of the Father, the Son, and the Holy Ghost, Whose Blessed Vision we wish to behold for all eternity. Imagine what the world would look like if those who exercised the offices of civil government took this advice for their own. Imagine what the world would look like if each person, despite his sinfulness, attempted to live as a redeemed creature who remembers that He has been created by God the Father, redeemed by God the Son, and sanctified by God the Holy Ghost, offer all to that same Most Holy Trinity through the Sorrowful and Immaculate Heart of Mary, remembering that his very Guardian Angel beholds the face of God at all times! Imagine what the world would look like if each person knew and took seriously the Deposit of Faith that Our Blessed Lord and Saviour Jesus Christ entrusted exclusively to the Catholic Church for Its eternal safekeeping and infallible explication. Imagine what the world would look like if we trusted in the power of Our Lady's Most Holy Rosary to retard evil in our own lives and in that of the world around us. "Let us make man to our image and likeness." The mystery of the Most Holy Trinity, which was revealed to us by the Second Person of the Blessed Trinity made Man in His Most Blessed Mother's Virginal and Immaculate Womb, Our Blessed Lord and Saviour Jesus Christ, was contained in these very words of the first book of the Old Testament, the very written Word of God Himself. Anyone who thinks that there is a moment in our lives when we can the Most Holy Trinity and relegate any the Incarnation of the Second Person of that Most Holy Trinity to the merely "private" realm of life that has no direct relationship to public policy and statecraft ought to consider these words from The Athanasian Creed, which as, His Excellency Bishop Robert F. McKenna, O.P., noted in his Trinity Sunday sermon at Our Lady of the Rosary Chapel in Monroe, Connecticut, yesterday, May 18, 2008, was removed from the Divine Office when he was in the novitiate in 1951, part of the early revolutionary handiwork of the Vincentian Annibale Bugnini and the Franciscan Ferdinando Antonelli. The Father is made of none, neither created nor begotten. The Son is of the Father alone, nod made nor created but begotten. The Holy Spirit is of the Father and the Son, not made nor created nor begotten but proceeding. So there is one Father not three Fathers, one Son not three Sons, and Holy Spirit not three Holy Spirits. And in this Trinity there is nothing before or after, nothing greater or less, but the whole three Persons are coeternal together and coequal. So that in all things, as is aforesaid, the trinity in Unity and the Unity in Trinity is to be worshipped. He therefore who wills to be in a state of salvation, let him think thus of the Trinity. Who although He be God and Man yet He is not two but one Christ; one however not by conversion of the Godhead in the flesh, but by taking of the Manhood in God; one altogether not by confusion of substance but by unity of Person. For as the reasoning soul and flesh is one man, so God and Man is one Christ. Who suffered for our salvation, descended into hell, rose again from the dead, ascended into heaven, sits at the right hand of the Father, from whence He shall come to judge the living and the dead. At whose coming all men shall rise again with their bodies and shall give account for their own works. And they that have done good shall go into life eternal, and they who indeed have done evil into eternal fire. Our Lady is, as mentioned before, the daughter of the Father, the Mother of the Son, and the Spouse of the Holy Ghost. She was the instrument by which the Father had chosen from all eternity to send His Co-Eternal Son to us so that He might He receive from her by the power of the Holy Ghost a Sacred Humanity to redeem us on the wood of the Holy Cross, which has become for us a real manger from which we are fed the Divine Redeemer's very Body, Blood, Soul and Divinity. It is to Our Lady we must turn in order to get to Heaven. It will be her prayers for us, nunc et in hora mortis nostrae, that will serve as a final plea for us to be the recipients of her Divine Son's Mercy as we take our last breaths. We must show her, however, that we are hers, which we do by consecrating ourselves to her Divine Son, Our Blessed Lord and Saviour Jesus Christ, through her own Sorrowful and Immaculate Heart, and by praying as many Rosaries each day as the duties of our states-in-life permit. 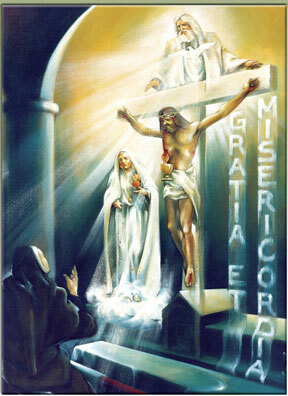 Each Rosary is begun and ended in the Name of the Most Blessed Trinity as me make the Sign of the Cross. We recite the Apostles' Creed at the beginning of each Rosary, meditating upon the specific mission of each Person of the Blessed Trinity. We recite the Gloria Patri, in which we give glory to the Three Divine Person of the Most Blessed Trinity, six times in each Rosary, eighteen times if we pray a complete fifteen decade Rosary during the course of a day. Each nation on the face of this earth, without any exception whatsoever, is called to honor her publicly as its Queen, replete with holidays so that pilgrimages could be honor the daughter of Father, the Mother of the Son, and the Spouse of the Holy Ghost. As we make the Sign of the Cross at the beginning of the recitation of Our Lady's Most Holy Rosary, we should be reminded of the fact the lives of our souls began anew when a priest baptized us in the Name of the Father and of the Son and of the Holy Ghost. We pray each day that the lives of our mortal bodies here on the face of this earth will end shortly after we have been given an Apostolic Blessing following the administration of the Sacrament of Extreme Unction. Those who keep this in mind will be able to counteract the naturalism that keeps even so many Catholics "earthbound" and worried about this or that "tree" when the real problem is the forest of naturalism that has grown up since the overthrow of the Social Reign of Christ the King. Saint Pudentia, pray for us.